If you have a dog at home, you’ve definitely heard about heartworm at some point during their life. In fact, you may be particularly attuned to the topic because it’s Heartworm Awareness Month. 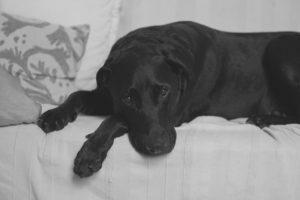 Because this disease is so common, there are many myths and misconceptions about heartworm in dogs. Do you know the truth about the cause, symptoms, testing, treatment, and prevention of this potentially fatal disease? Learn what’s myth vs. reality. There’s one way a dog can get heartworm: from the bite of an infected female mosquito. This is the only way your pup can get the disease. 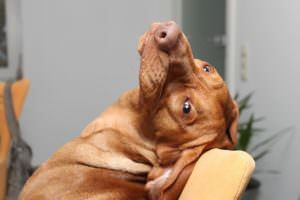 The good news is if your dog becomes infected with heartworm, you don’t need to keep her away from other dogs in the home or neighborhood friends. The bad news is it is impossible to know if a mosquito carries the disease. If your pup gets bitten by the insect, there is a chance she will get heartworm. The FDA reports that heartworm is most commonly found along the Atlantic and Gulf coasts from the Gulf of Mexico to New Jersey and along the Mississippi River. However, there are cases reported in every single US state. If left untreated, there are very serious consequences. Your dog could develop heart failure. Her belly may appear swollen because of excess fluid in the abdomen. The harm is not immediate, but the sooner you can get your dog treated, the better. Once your dog is bitten by an infected insect, it takes about seven months for the larvae to mature into adult heartworms. They take up residence in your dog’s heart, lungs, and surrounding blood vessels and start reproducing. Adult heartworms can grow up to 12 inches in length and live 5-7 years. Dogs can have hundreds of worms in their system. Untreated, these worms can cause severe lung disease, heart failure and damage to other organs in the body. As with many other serious diseases, early detection is key. Since symptoms are sometimes slow to show, it is extremely important your dog visits her vet annually for a simple blood test. Even if your dog takes heartworm prevention year-round (we’ll get to that in a little bit), she should still be tested by a vet. A second test will be administered to confirm your pup has the disease. Your dog will need to slow down. “Physical exertion increases the rate at which the heartworms cause damage in the heart and lungs,” according to the American Heartworm Society. 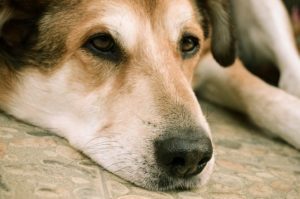 Before treatment starts, some dogs will need therapy to stabilize their condition. Once your dog is stabilized, treatment starts. There are different types of treatment, depending on the severity and maturation of the heartworms. Oftentimes, your dog will get an injectable drug. Several months after your dog’s treatment is completed, they will be tested again to make sure there are no more traces of the disease. Since heartworm travels via mosquitos, there is no “natural” remedy for the disease. The best way to prevent it is by prescriptive medicine from your vet. There are different types: a monthly chewable pill (in a flavor your dog will love), topical “spot on” medications, and an injectable that is given every six months. One popular brand is Heartgard. But always talk with your vet for a recommendation. This is what you need to remember: make sure you give your pup their heartworm medication on time. Confirm that whatever medicine you give is specifically for heartworm (that’s where the vet prescription is key). This is one monthly appointment you shouldn’t miss. Preventative medicine costs anywhere between $70-$200 a year. Consider this: treatment for full-blown heartworm can cost upwards of $1200. Which would you rather pay? More than a million dogs in the U.S. have heartworm disease according to the American Heartworm Society. The best way to keep your dog out of that statistic is by giving them preventative medication. Even if you live in an area without many mosquitos present, heartworm is still very possible. Stay on time with the medication and make sure your pup is tested annually. Sometimes symptoms take a long time to appear, so testing is critical.